Insect Groove, a showcase of work from 1992-2000 by Canadian electroacoustic composer, computer-assisted performer and improvisor Sarah Peebles, set up a rewarding interface between digital abstraction, group improvisation, 21st century programme music, Zen performance and ecological manifesto. Dedicated in no uncertain terms to the Elaho Valley in British Columbia, where a large region of forest is under threat from the timber industry, the album is visionary in its experimental merging of the primitive with advanced digital technology. 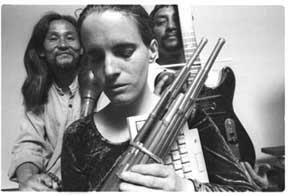 This symbiosis, rather than split, is evident in Peebles's chosen tools: combining the shô, the ancient Japanese mouth organ with its cluster of bamboo pipes, and Macintosh Max programming, through which she accesses a wide range of samples and patches. Peebles herself, originally from Minnesota, spent some years living in Japan studying Japanese court and ritual music; hence her choice of shô, and her interest in performing alongside other musicians and artists who draw on the ritual traditions of the Far East, including Ko Ishikawa, also on shô, and Jin Hi Kim, on electrified komungo, a fourth century zither. If this sounds like a studied and meditative reversion from contemporary technology, what comes out, once combined with Peebles's live programming skills and ear from contrasting density and inventive transformation, is a series of incredibly active soundfields that tick and coagulate and distort their way into presence. Each performance, and these are generally all live performances, explores a living environment, taking place somewhere between the temple, the jungle and the Mac screen. Digital technology, electric effects, samples of natural sounds (water, birds) and acoustic vibration are welded into a fluid but differentiated texture that leaves no source in place, and makes it impossible to tell machine and environment apart Technology can dwindle to a fax glitch in the midst of a reverberating mirage spun out from a bowed electric guitar, but it also turns the tables, so that the computer becomes the aquatic medium through which guitar, birdsong, and sine tone merge. It's testimony to the integrity of the sound Peebles pursues that the tracks here form a coherent series when their sources are so radically different "Drillbit Skiploop" assembles a brilliant mesh of thin, fibrillating electric drones, like a shoal of digital phones, that whirr and shuck and croak, holding just off from the regularity of a pulse. Lifeforms in tension. It is in fact one long treatment of a CD skipping. The ghostly throbbing and whining on "Higurashi in Yamanashi" sounds like a looped and distorted drone, but is a field recording of Higurashi cicadas from Kai Komagatake Shrine in Japan. Peebles's collaboration with David Toop from Hot Pants Idol fits effortlessly into this already Ballard-style mix of the west and the wired: here the shô's resonance bleeds across more static throbs and whispers of interference and generator sounds. The same is true of the two performances included featuring the trio Cinnamon Sphere - comprising Nilan Perera on electric guitar and the calligraphic improvisations of Korean visual artist Chung Gong Ha. Though one can only guess at the visual wing of the performance, Perera's interests in Sri Lankan folk music and Harry Partch nicely match Peebles' own electricism and revision of the primitive. The duo, augmented by Ishikawa or Kim, mix tidal undulations of tone with the ability to pick out sharp flecks of texture in complex aural environments. Hover collects tracks from several performances of Cinnamon Sphere at various art and music galleries in Toronto and Guelph, Ontario, from 1996 to 1999. Perera's guitar is often bowed, sending out resonant, gong-like souonds, or hammered and teased with sticks to create shimmering tremolos, warps and glides. Into such fulsome but often metallic sounding vibrations. Peebles mixes birdsong; the abrasive resonance of the shô; glistening sounds somewhere between a glitch and a water sample; and again, those eerily gliding and rasping cicadas. Sounds seem to blossom effortlessly out of the electrified instruments and the Mac patches as it meditated into presence, but this is not insipid music. There is a poise and tautness and silveriness to its glide that comes perhaps from the terseness of Japanese ritual music. But the temple is also bent into hallucinatory four dimensional shape, the clarity strung out in tones that wobble, drift, twang and scintillate. Protest CD | Reviews | Notable Projects | Contact the Artist at speeb@sympatico.ca | Resources | What's New?